The Eco-Drive Continual calendar Chronograph watch has an amazing timepiece and good looking shape for those, who always have desire for a watch that must be charming with its shape as well as basic working features. This solar –based watch uses solar energy with its internal batteries which always work properly. So you will find your watch working whenever you need it. Now you need not to change your watch charging cells that was costly experience. Any way this beautiful watch enriches your life with pleasure. 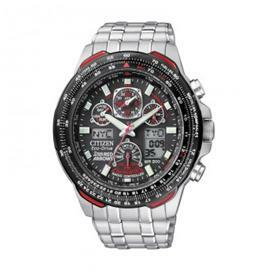 This lovely Eco –Drive watch is manufactured by world famous watch making Company Citizen. In last 75 years, since Company started its business in whole the world, Company achieves a new position with its ECO-Drive watch which is lovely and admired by a lot of worldwide Eco lovers. The Eco-Drive Continual Calendar Chronograph Watch works between 120 and 270days by a single charge, because of its power save function. Owing to its internal warning system, when it is on low power it will warn you with early five day notice. This fantastic product will ease you from batteries shortage problem. Now with this amazing product, you can perform your daily routine work with a pleasure, because it will charm your personality due to its number of features and its personality. This Solar based watch has a variety of styles. With this watch, your lovely wrist can be adorned smoothly. This charming watch is equipped with a lot of features as a soft brown leather strap, white stitching and a buckle that is comfortable on your wrist. This watch face is made with titanium case along with crystal dial window which is water proof. This watch claims numberless features. 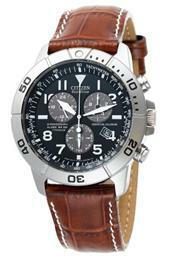 Its 1/20 second chronograph is capable of measuring up to 60 minutes. Its other features are listed as 12/24 time, dual time, an alarm, a date indicator and an internal calendar which always has accurate proper date and leap years through the year 2100. This watch enables you to change time zones. It’s another fundamental feature is its ability to resist water. It can resist water up to 200m.Its inner batteries are charged with solar energy enquired by direct sun rays. Its inner artificial sources also support this watch when required. In a sunny day it takes just 4 hours to have fully charge. When it is overcast day, it takes 12 hours. Afterall, with its internal light sources it takes automatically 43 hours to have a full charge.